What can a kiss change? A mother's kiss can be the miraculous cure to an infant. A paramedic can save a life through mouth to mouth resuscitation. This is a story about a man who obtains a supernatural ability to steal time. 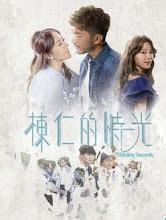 When paramedic Ching Man Kei (Natalie Tong) resuscitates Tsang Dung Yan (Benjamin Yuen) using CPR, he realizes that he has the ability to steal other people's time through a kiss. Yet the repercussions fall on the shoulders of Ching Man Kei who falls unconscious for two days and even misses her own wedding while her groom mysteriously goes missing. With his newfound gift, Dung Yan manages to change his fate, yet it comes with unexpected consequences. Despite the popularity of its leads, the show had disappointingly low ratings when it aired on TVB. Let us know why you like Stealing Seconds in the comments section. Please also share these fun facts using the social media buttons below.